Nuance just dropped a new Dragon dictation product in the Mac App Store called Dragon Express ($49 introductory price), a scaled-back, less expensive version of their Dragon Dictate software. This new version will reside in Lion’s menubar, allowing you to activate the dictate window with a keyboard shortcut or mouse click, and begin converting your speech to text immediately. From there you’ll be able to quickly email it, run a web search with the text, copy it, or share to the usual social networking suspects. Full press release after the break (via MarketWatch). BURLINGTON, Mass., Nov 10, 2011 (BUSINESS WIRE) — Nuance Communications, Inc., today announced the immediate availability of Dragon Express, an introductory voice recognition app for Mac OS X Lion. Dragon Express is an easy and fun way to put words to work without the hassle of typing, allowing users to do more in less time. Dragon Express is available exclusively for download from Apple’s Mac App Store. 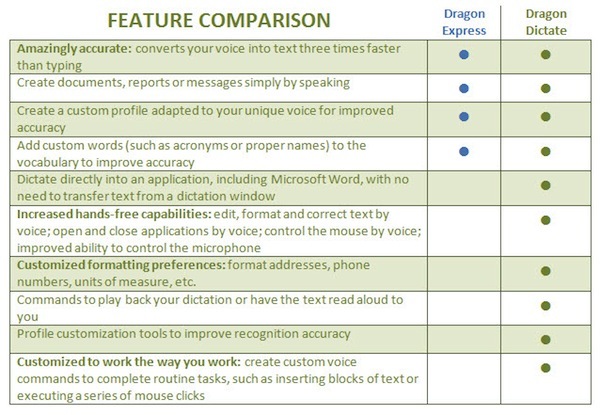 Dragon Express is the latest member of the Dragon family of speech recognition software that lets people control a computer with their voice. It’s the fast, hands-free way to turn speech into text, whether sending email, surfing the Web or posting an update to Facebook and Twitter. Dragon provides an easy, natural way to get more done in less time. Dragon Express is priced to provide the broadest range of people with an opportunity to experience the power and performance of speech recognition. Dragon Express can be conveniently accessed from the menu bar at any time and doesn’t require a network connection. Users dictate directly into the Dragon Express window, using the internal Mac microphone or a USB headset microphone (which can be purchased via www.nuance.com ), and the text instantly appears in the Dragon Express window. When finished, Dragon Express places the transcribed text into the application of choice. The download comes with a short enrollment so that the app can better recognize a user’s unique voice. Dragon Dictate, the most full-featured and advanced speech recognition software for Mac OS, was recently updated to version 2.5. Dragon Dictate 2.5 includes many features beyond those in Dragon Express. These features include the ability to dictate directly into applications, edit, format and correct recognition errors by voice, open and close applications by voice, control the mouse by voice, create custom voice commands and support for the recently released Dragon Remote Mic app for iPhone. Nuance Communications, Inc. is a leading provider of voice and language solutions for businesses and consumers around the world. Its technologies, applications and services make the user experience more compelling by transforming the way people interact with devices and systems. Every day, millions of users and thousands of businesses experience Nuance’s proven applications. For more information, please visit www.nuance.com . Trademark reference: Nuance, Dragon and the Nuance logo are registered trademarks or trademarks of Nuance Communications, Inc. or its affiliates in the United States and/or other countries. All other company names or product names referenced herein may be the property of their respective owners.